The record number of Spring passage Stonechats through Wanstead Flats hasn't abated just yet, with another new bird found on Saturday - but this rather striking looking male is the first bird which I've come across showing several features more in common with Continental Stonechat (rubicola) than our British breeding birds (hibernans). This is not a big surprise, as the south-east of England continues to record more and more continental 'type' birds aided mainly by its geographical location. 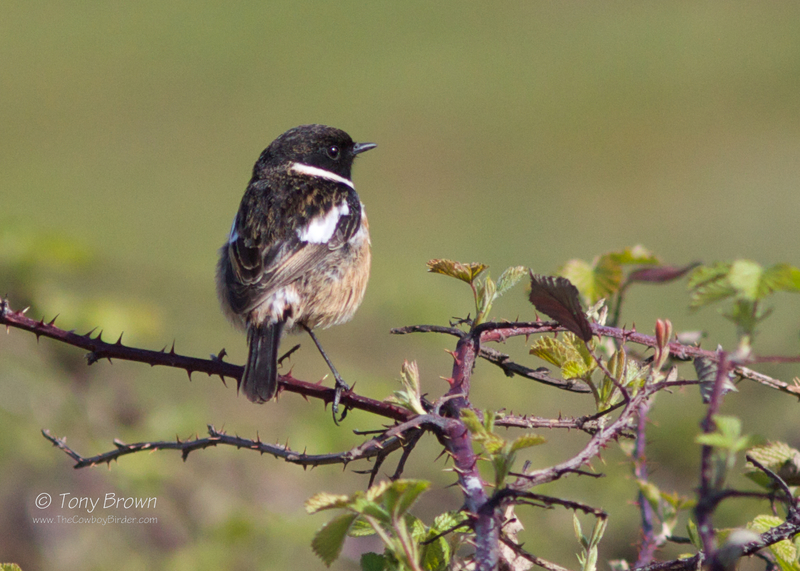 The complexities of Stonechat in regards to race give even Redpolls a run for their money - and you need to be some kind of scientist to unravel all their overlapping genes* (see foot of page). But in this bird the key features which stood out were the pronounced white collar, contrasting with the jet-black head and very dark mantle, back and wings. There were noticeably large, broad white-wing patches, and the bright flame orange breast didn't continue onto the underparts and also a white rump (although slightly streaked) - in hindsight it would have been good to get a few flight photos as seeing the underwing pattern might also have been interesting. The white rump is just about viewable in this photo. *Just as a footnote; whilst watching the bird I happen to noticed it poo on the top of a wooden post and have collected a sample for DNA analysis - all I need now is a scientist to kindly extract the DNA! The 2017 crown for London's 1st Wheatear of Spring is sitting firmly on the head of Wanstead today, with a cracking male gracing the Flats. So often, Wanstead has played second fiddle to southern London sites like Beddington Farmlands as they record several fresh-in early arrivals, as we sit back with baited breath eagerly awaiting our 1st - but not this year! We haven stolen a March (11th of March to be precise) on our London rivals by taking the crown at circa 8.00am this morning. 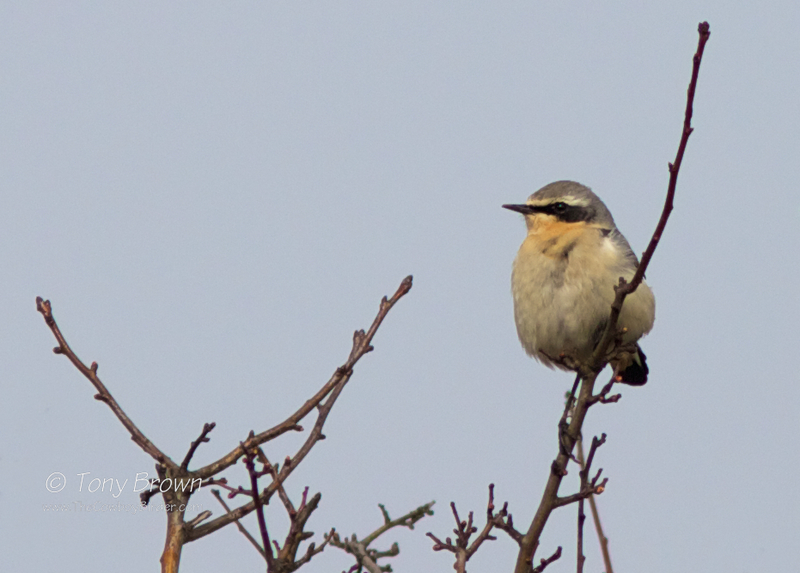 Even with my eternal birding optimism I didn't actually believe there would be a Wheatear on Wanstead Flats today, it is after all only the 11th March - and they're not due here for a least another week. But the weather forecast looked promising (an unseasonably warm 17ºC and a light southerly) and there had also been a bird seen in Surrey only yesterday (outside the London recording area), but after one circuit of the Flats with my compatriot Jono it was looking increasingly less likely. As we had both been out since around 6.30am, it was still early (8.00am) and I suggested another circuit. As we crossed the Brooms I picked out a slim Skylark sized bird distantly in flight, but the rocking/barrelling flight of the bird suggested more investigation, following the bird it landed in the top of the nearest copse and moving closer to get a better view - there was the prize - a male Northern Wheatear in all its Spring glory. It feels great to finally achieve a little personal goal in finding the patch's 1st Spring Wheatear, and with the added bonus of it also being a London year-1st, I might actually treat myself to lay-in next week. 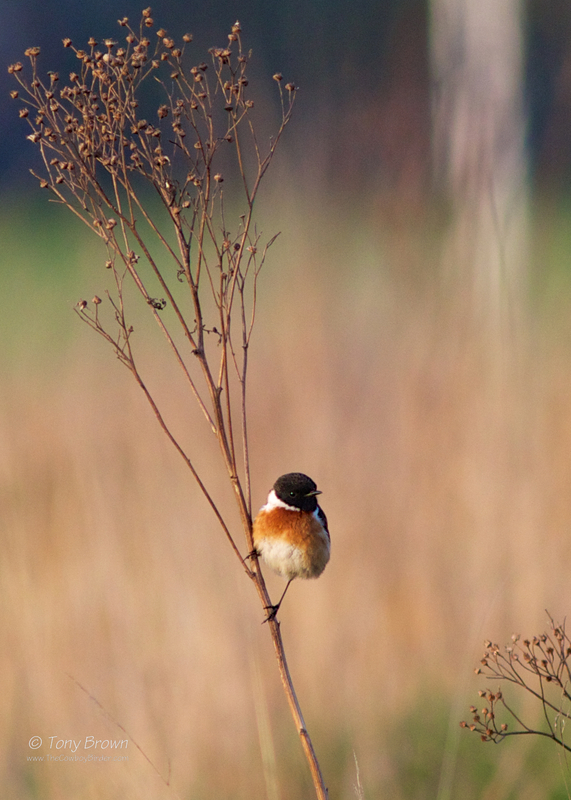 I would've loved to have given you an amazing image of all nine Stonechats that graced Wanstead Flats on Saturday morning, but this was real and fast daytime spring passage movement and within minutes the birds had all quickly moved on. I had earlier found four birds in the lower Broom fields (which on any given day is an excellent Spring count for Wanstead) and was recalling there whereabouts with Rob Sheldon when a couple of birds flew into view from where we were standing in the middle of the Brooms. These initial two birds quickly doubled to four and then doubled again to eight! As we watched the birds fly by one by one, low across the tops of the grass they quickly headed to the far corner of the Flats towards the west end of Long Wood, after a quick couple of recounts we both agreed there actually nine birds in the group, but as quickly as they had appeared they had all soon disappeared. Nine birds! 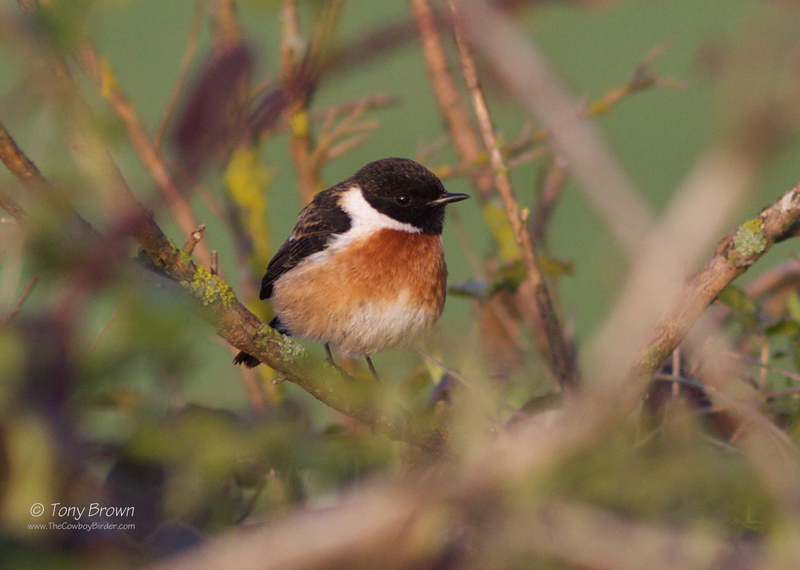 Wanstead has the odd wintering Stonechat and typically on Spring and Autumn passage you can expect to see two or three birds, but to witness a group, party or even a flock (I'm not sure at what point bird numbers become flocks) of Stonechats daytime migrating was an all to brief but an amazing local spectacle and has easily become the highest number of Stonechats recorded on Wanstead Flats. 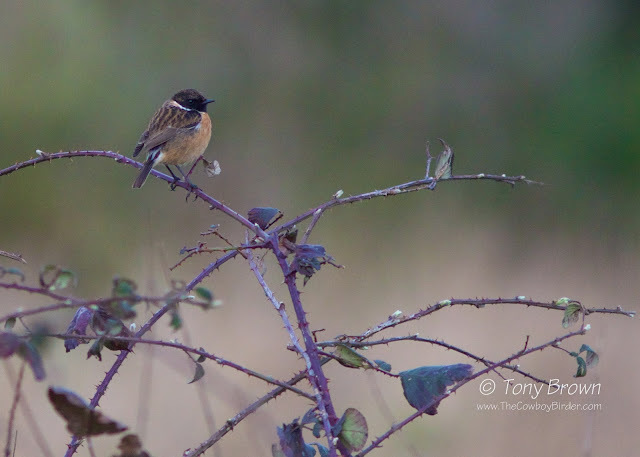 The Stonechat is one bird which continues to benefit from our milder winters of late and surely it won't be long until Wanstead records a double-digit number of these birds, I just hope I'm around again to witness it. Just one of the magic nine!